Nutter Butter Boos - Home. Made. Interest. 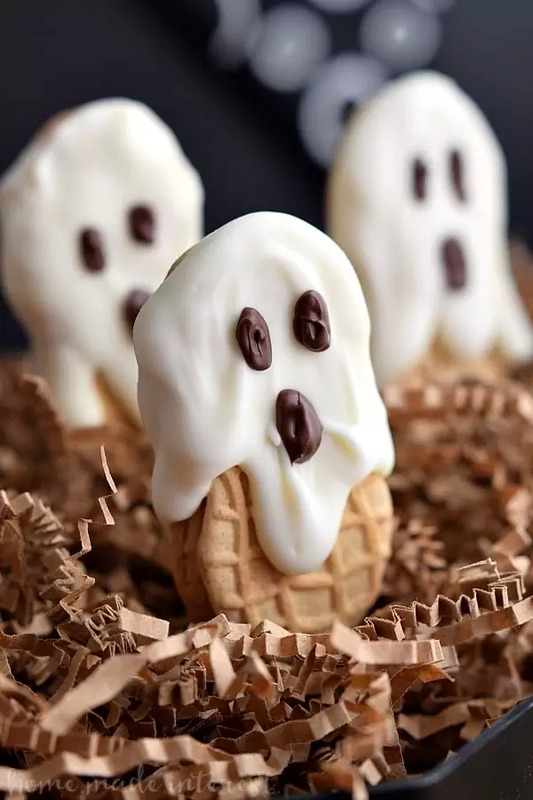 These old school Nutter Butter Boos are cute ghost cookies that make an easy Halloween dessert that is the perfect Halloween party food. We’re having a #ThrowbackThursday on the blog today with these old school Nutter Butter Boos. 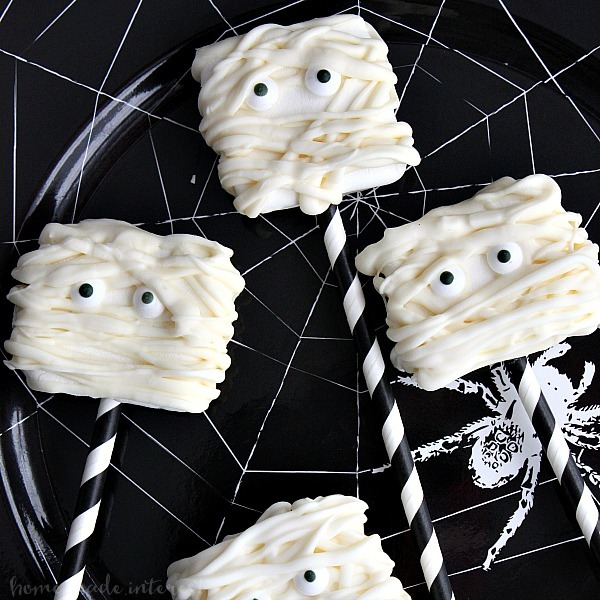 These cute little guys are super easy to make and perfect for all of those upcoming Halloween parties. All you need are three simple ingredients: Nutter Butter Cookies, white chocolate or almond bark (my preference), and regular chocolate. Once you get going these little ghosts go quickly so be ready. I suggest using a cooling rack to help prop your cookies up but if you don’t have one you can just hold them up while you pour on the chocolate and then lay them down on a piece of parchment paper or wax paper when you are done. The technique is similar to the Mummy Mallows we made last week. You start by melting the almond bark, pour it into a sandwich baggies, snip off the top of one corner and then squeeze it over the Nutter Butter. 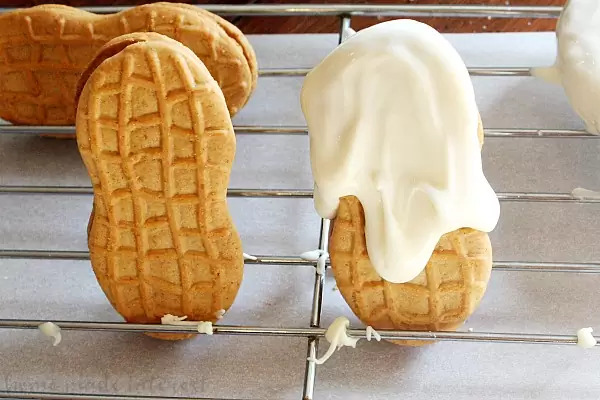 Instead of making stripes like you did with the Mummy Mallows this time you can just squeeze it over the top arc of the cookie in a big glob, then start tapping the bottom of the cookie on the table to make the almond bark begin to drip down. You can tilt it from side to side to make uneven edges at the bottom of the bark so it looks like the bottom of a ghost. They remind me of little kids dressed up in a sheet with some holes cut out for eyes and nose. Totally cute! Let the almond bark dry for 5 or 10 minutes and then you can go back and add the eyes and mouth. Melts some chocolate chips in the microwave, pour the melted chocolate into a sandwich baggie and again snip off the tip. gently pipe three circles of chocolate on to each Nutter Butter ghost. Once it dries you’re ready to serve! You can easily make these ahead of time and store them in a sealed bag or container until you are ready to use them. Just make sure the chocolate is completely dry before storing. This old school Halloween dessert is the perfect Halloween party food. Kids are going to love these Nutter Butter ghost cookies. Place almond bark or white chocolate in a microwavable bowl or mug. Lay your cookies out on a piece of wax or parchment paper, or prop them up using a cooling rack by putting each cookie in between the bars of the cooling rack. Put the melted bark in a sandwich baggie and snip a little bit off of one corner to make a hole. Squeeze melted bark over the top arc of the cookie then gently tape the bottom of the cookie against a flat surface to make the melted candy begin to ooze down the cookie. Shift it from side-to-side to create uneven edges on the bottom of the ghost. Let the almond bark dry then pipe on eyes by melting chopped chocolate, adding it to a sandwich baggie, and cutting a hole in one corner. Pipe three circles on each ghost cookie, 2 eyes and a mouth. Let dry completely then store in an airtight container until ready to serve. What easy Halloween desserts are you loving this year? Nutter butters are my favorite! Love these! 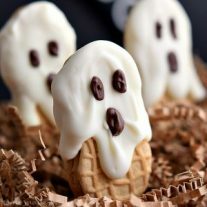 these Nutter Butter ghosts are the cutest things ever!! So cute! 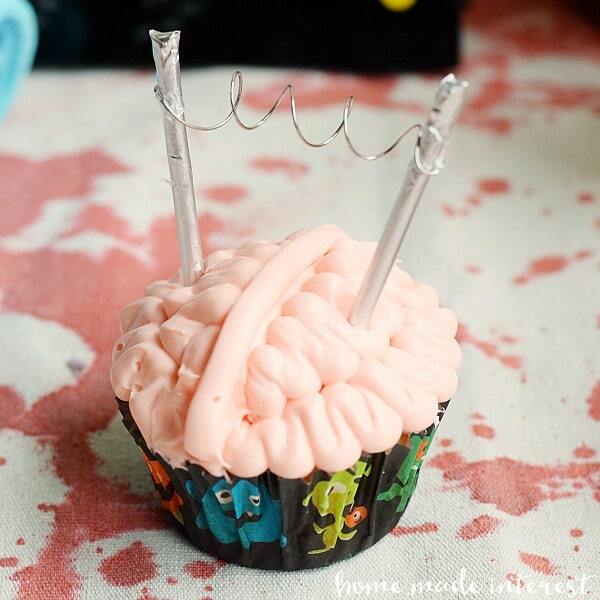 Perfect for Halloween parties– I bet they’re a hit!